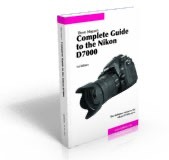 Yes, we still sell Complete Guides for some of the older, discontinued Nikon DSLR models. These guides are the most complete and thorough you'll find, and will get you fully up to speed with your camera. All of these guides are available as PDF eBook downloads (compatible with most Amazon Kindles, Apple iPads, and all personal computers running Mac OS X, Windows, or Linux). Why are some of the guides not available any more? That's because they were originally not set up for download and require rework, which triggers a bunch of things including new Copyright registration. The bigger issue is that I moved from one way of producing the guides to another after the D3 generation, and so besides the rework to get them ready for downloads, there's a lot of formatting and organization work that needs to be redone.